Hello guys, no doubt that the mtn free browsing cheat is still working and doing well with the help of eProxy, Xp psiphon, TweakWare, Http injector, KpnTunnel Rev and SparkVpn this cheat will go a long way because the mentioned vpns are not like Psiphon, Netify or Simple Server apps that expose the Host Address of the cheat. That's why we are calling to all site owners and blog owners that knows the host address not to expose the (Host Address) so we all can benefit from it, as we all know the high amount of purchasing data bundle in the country. Many of our beloved readers have been asking for the way to create ssh account to use with the latest mtn cheat, don't worry your request have been granted today we are going to drop the list of websites to create your own fast ssh account. If you don't know what is SSH let's quickly give you a short definition of ssh. 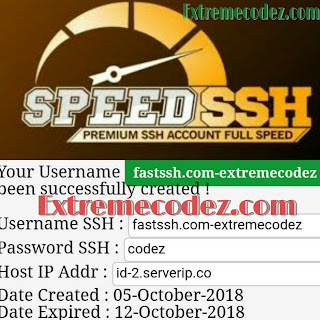 Secure Shell (SSH) is a cryptographic network protocol for operating network services securely over an unsecured network. The standard TCP port for SSH is 22. The best known example application is for remote loginto computer systems by users. SSH provides a secure channel over an unsecured network in a client-serverarchitecture, connecting an SSH clientapplication with an SSH server. Common applications include remote command-linelogin and remote command execution, but any network service can be secured with SSH. We guess your done with watching the video if you like to use the mtn free browsing cheat CLICK HERE for settings. And if you like to learn how to power all your apps with the mtn mPulse data CLICK HERE for settings. If you also want video settings on how to use the mtn cheat and your mPulse data to power all your apps you can also CLICK HERE for it. So back to today's topic below are the sites to create your own ssh account. That's all please kindly share this post to your friends and family. And if you encounter any problem kindly drop your comment below.